Passive Power over Ethernet (PoE) adapter allows to power LAN devices through typical 4-pair twisted-pair cable (eg UTP). 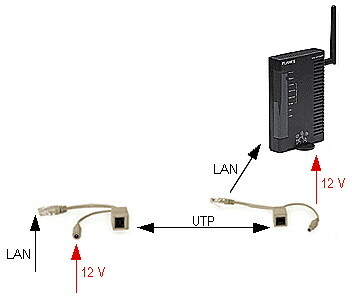 This solution enables Access Point powering, which is placed in hermetic box just by the antenna (to lower the loss in the RF cable), via twisted-pair cable from power source located inside a building. The kit includes two passive devices showed on the below pictures. 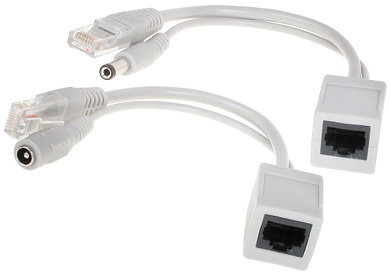 They are equipped with RJ-45 and 2.1/5.5 mm (power) connectors, and prepared for work with majority of popular WLAN devices. The range depends on the resistance of twisted-pair cable, current consumption of the device and an acceptable voltage drop between the power adapter and the device.